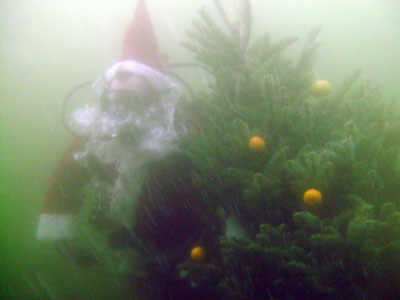 At 6 AM, Terry A. and Tony from Dive N Surf dragged a donated Christmas tree through the surf and anchored it 20 feet below the surface in 40 feet of water. 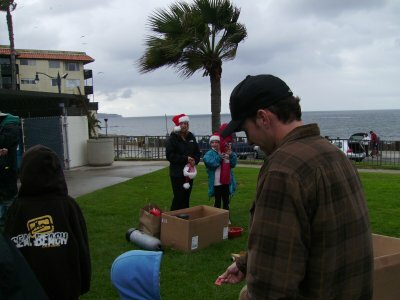 Our mission, if we chose to accept it, was to decorate it with biodegradable decorations and photograph Santa Claus with the other divers. 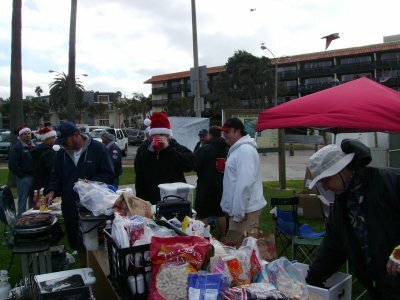 A toy drive and barbecue was to follow; Dive N Surf was in charge of the diving, Divevets was in charge of the debriefing. I was on the Divevets’ commitee along with Hollywood and Montana. 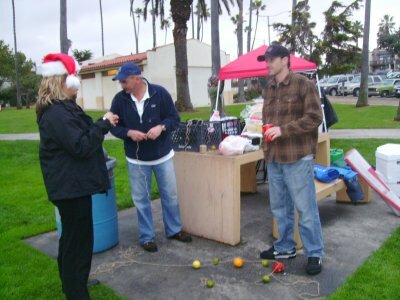 … while Dan, Montana and a few others strung the fruit on hemp twine. There’s nothing like celebrating the over abundance of food in America than by using perfectly edible fruit as Christmas decorations! 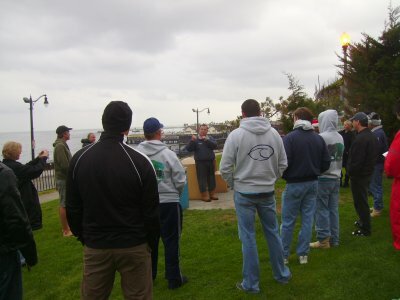 Tony gives the dive briefing. 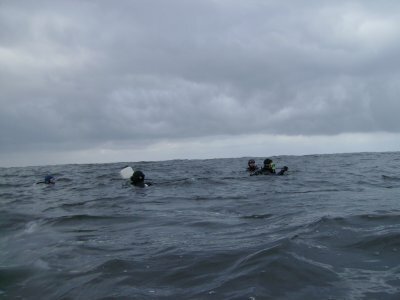 “Vis isn’t that great, so swim to the buoy and drop down on the tree, otherwise you’ll never find it…” Tony said. Other standard dive event procedures were reviewed. Dan suits up to play the all important role of Santa Claus. It started to rain a bit. 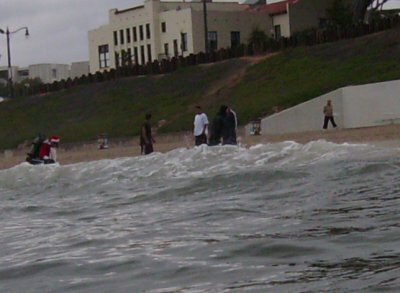 I carried about 15 pounds of fruit through the surf and made an easy entrance alongside Dan. Santa waves to the camera. 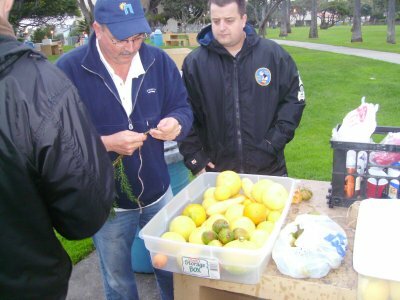 The divers met at the marker buoy and descended; I was amazed that even though my 15 pounds of fruit floated, I had no problem sinking. 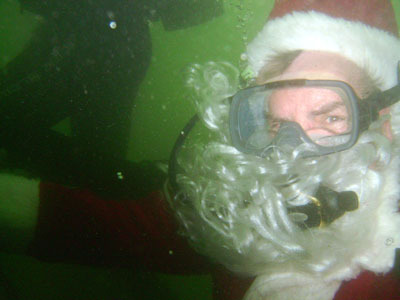 A close up of the underwater Santa Claus; how he keeps water out of his mask with that beard on is a mystery to me. Santa poses with the tree. I managed my best to untangle it and hang the blob of fruit on the tree. 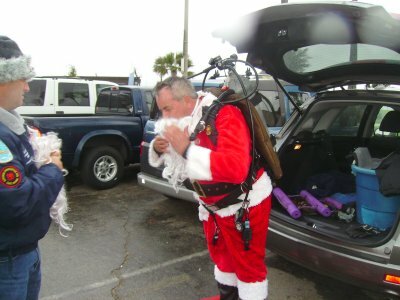 The official Dive N Surf cameraman takes pictures of the other divers as they pose with Santa. I have to say, vis sort of really sucked. 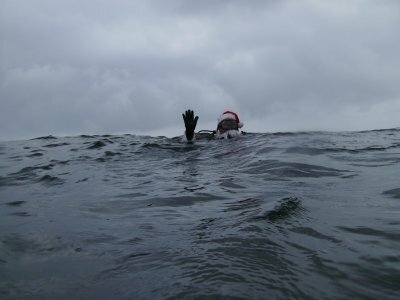 Most of my pictures with the other divers didn’t turn out as I was too far away; I had to allow the “real” photographer to do his job. 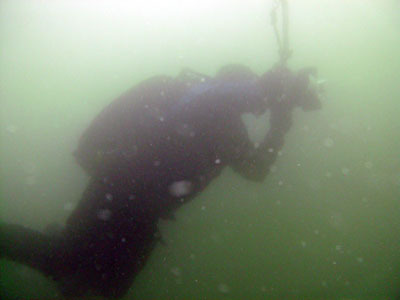 I descended to 40 feet and hung out around the tree; TwinDuct sort of went off on his own midway through the dive, as did most of the other divers. 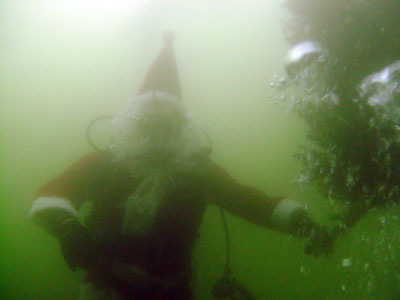 Santa and crew headed in after about 20 minutes underwater; I swam back underwater where I consumed about 800 psi of air. 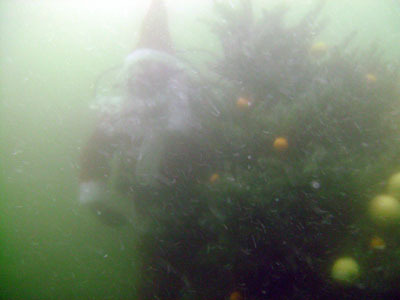 Just another day in Los Angeles… Santa Claus emerges from the ocean. The Dog Police almost arrested Cyber The Attack Dog for a leash violation. 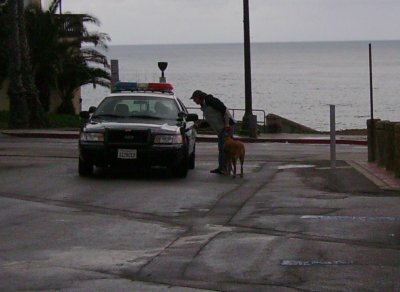 Dive Bum Don had to pay an instant cash fine to the Dog Police to keep Cyber out of jail. “Screw them, they can leave,” was the reply. 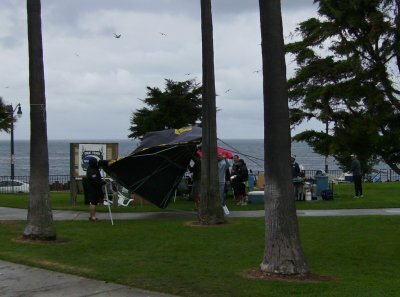 A little wind and rain and the party whimps want to leave! 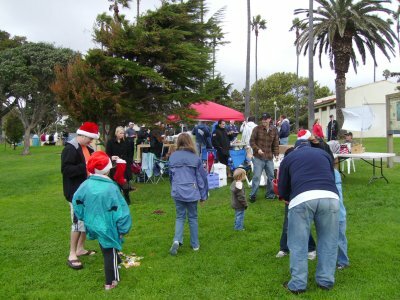 Montana organized some games… the egg toss, a three legged treasure hunt and a relay race; she did a spectacular job organizing this part of the event! 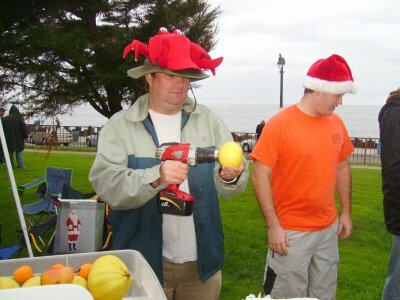 The only thing that sucked about the egg toss was that I had to put my beer down to play… my brother and I lost after the defective egg that I was given broke in my hands. Montana raffles away valuable prizes… a gym membership, SCUBA gear, a debriefing chair, a makeup kit, CDs and the grand prize – a six pack of Budweiser, donated by yours truly! 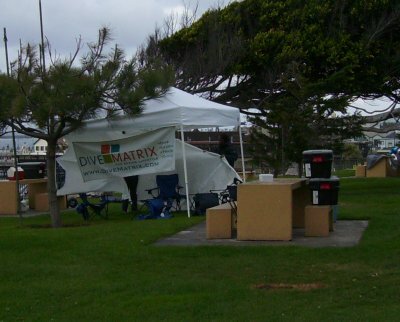 We had a few more participants and chicks at our event than Divematrix had at theirs. 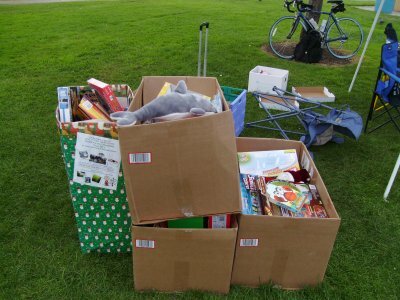 The valuable collection of toys awaits the Fire Department pickup. 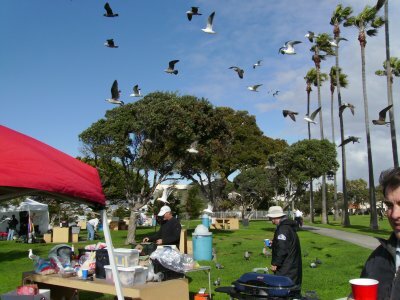 Al Qaeda birds launched a deadly poop attack on our event! They pooped on us, because they hate our freedom. 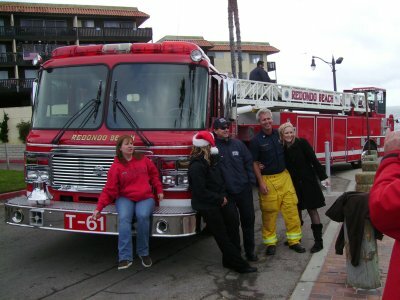 The Fire Department stopped by around noon to pick up the donated toys; my offer of a few beers to the Firemen was politely turned down. Some women fainted at the sight of real firemen. 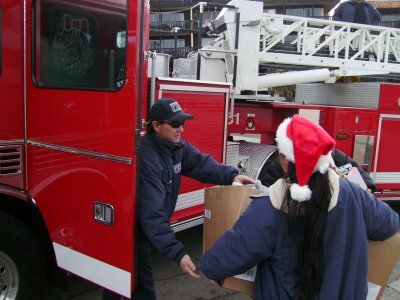 It took several minutes to load the thousands of dollars worth of toys into the fire truck. 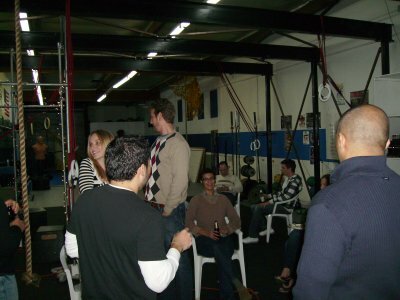 My cage fighting friends were having their annual Christmas party. The last time I was around this many drinking and dangerous people was 20 years ago at Walker’s cafe, when two rival biker gangs were about to fight over an order of french fries. The guy to the far left is training for the Senior Citizens’ division of the UFC. Seems like you had a nice time. No dive at Marineland this Sunday? My buddy and I went out Friday morning and the 120 reef was in prime conditions. At least 25ft visibility and pretty still conditions. 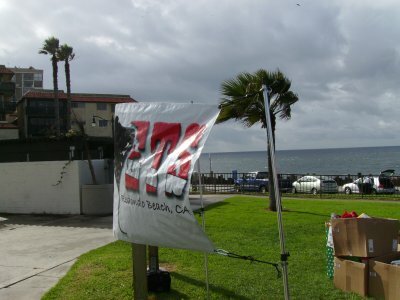 Had a bit of a hard exit due to the low tides, but besides that everything went well. Other than the vis being crappy I would say it was a successful event. Thank you for sharing something so incredibly amazing!! !